Even if you’re not an expert birdwatcher, you’re sure to know a cardinal when you see one. Their beautiful red feathers make them one of the most loved birds in America. Cardinals live in the eastern United States only so if you live west of the Rocky Mountains, you’ve probably never seen one. 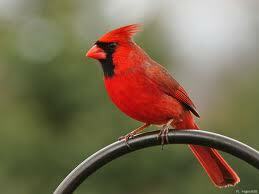 All About Cardinals: Their beautiful red feathers make them one of the most loved birds in America. 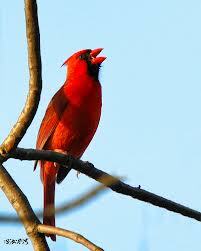 Cardinals eat insects, grain, seeds and fruit. They don’t migrate south for the winter, but rely on bird feeders for food during cold, snowy months. Cardinals are brilliant musicians. They can sing over 24 different songs and both males and females sing! 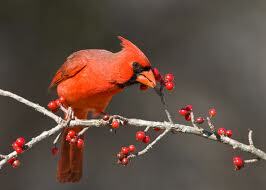 Cardinals eat insects, grain, seeds and fruit. Male cardinals protect their territory. They sometimes run into windows because they think their reflection is another bird. During the nesting season, the male cardinal finds food for the female who takes care of the babies. Cardinals sometimes join flocks of birds. Scientists believe female cardinals sing to tell the males when they need food. They can sing over 24 different songs and both males and females sing! A short documentary about the Northern Cardinal. Question: Do cardinals raise one batch of chicks each summer? Answer: Cardinals raise as many as three groups, or clutches, of eggs each summer. 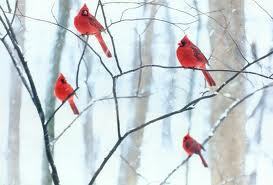 Enjoyed the Easy Science for Kids Website all about Cardinals info? Take the FREE & fun all about Cardinals quiz and download FREE Cardinals worksheet for kids. For lengthy info click here. Declan, Tobin. " Cardinals Fun Facts for Kids ." Easy Science for Kids, Apr 2019. Web. 20 Apr 2019. < https://easyscienceforkids.com/all-about-cardinals/ >.